September of 2010 marks a unique anniversary for Chad & Jeremy. It sees a half-century since Chad Stuart first met Jeremy Clyde. 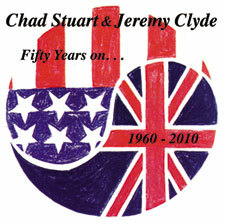 To celebrate this event, Chad & Jeremy will be out on the road for another of their popular US concert tours, but this time with a special twist - available at their live shows will be an exclusive compact disc entitled Fifty Years On?, featuring ten songs selected for this disc because of their personal meaning to Chad & Jeremy over the course of their musical journey together. This exclusive 'tour CD' will not be available in stores, but only at C&J's upcoming live shows, and for a brief period of time at Chad & Jeremy's Online Shop, so that you too can share in the celebrations even if you can't make it to one of the shows. "Apache" holds a very special place in both Chad & Jeremy's hearts as the song that Chad first played to 'prove' that he actually knew all the Shadows' hits. Later, C&J performed the song as members of "The Jerks" in their pre-fame days, and feature it in their modern concerts. Also from those distant days is the Buddy Holly classic "Well All Right". From their 1960s heyday come two numbers - "Take Out Some Insurance" and "You Need Feet". "Insurance" has never been commercially recorded by the group before, but has its origins in their very first tour of the USA, and visits to small radio stations across the USA where they discovered that old 45 rpm singles which had slipped off of the charts were being thrown out by disc jockeys. Ever the record collector, Jeremy rescued these promo records by the handful, and still has the vinyl copy of "Insurance" that he liberated from a US radio station sometime in 1964. The song is now included in their concert performances. The light hearted closing number for their modern-day concerts is "You Need Feet", best remembered as the final song on 'The Ark' - Chad & Jeremy's final original 1960's album. Representing their all-too-brief 1980's comeback is "Don't Look Back". This song, co-written by Jeremy Clyde and songwriting partner David Pierce, was first heard during their late 1980s concert appearances, and has been revisited with a new touch for a new decade. Says Chad, "Stylistically, it's the way the Jerks might have played it back in the day, if they could've figured out how!" Two songs from two different pens - in two very different styles - represent Chad & Jeremy's popular 21st century live concerts. First, "Doghouse Blues" is exactly what it claims to be - a bluesy, auto-biographical piano number from Chad. Secondly, "Lady Wants A Gentleman" is a poignant Clyde-Pierce track that has proven a big hit with concert audiences in recent years. Lastly, we see a glimpse of the C&J that has never been heard before. "So Right Tonight", "What's In A Name? ", and "Closed For Repairs" are three Clyde-Pierce numbers that make their debut on this release, and point the way forward to the Chad & Jeremy of the coming decade and beyond. That's the last fifty years, Chad & Jeremy style - in a way you've never experienced them before. Be sure to come to one of the Fall 2010 shows and share in this very special anniversary. Perhaps the most important song on Fifty Years On... from a personal standpoint is "Apache", the song that first brought Chad & Jeremy together. This video pays tribute Chad & Jeremy's lifetime of friendship and to the 50th anniversary of that fateful day in September of 1960 when Chad Stuart first played "Apache" for Jeremy Clyde, who knew at once that he had found a musical brother. Prepared specifically for C&J's Official YouTube Channel, the clip merges vintage photographs and contemporary performance footage for a decidedly retro feel. This CD is now sadly out of print. "Lady Wants A Gentleman" from this disc appears on 2013's "Rien Ne Va Plus". celebration.